Location: Cieurac, in the Meurthe-et-Moselle departement of France (Lorraine Region). 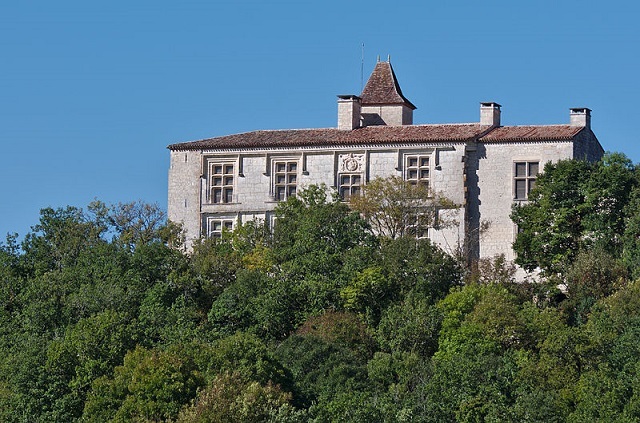 Notes: The castle of Cieurac is located in the town of Cieurac, in the department of Lot.The present castle was built on the grounds of an ancient castle of the thirteenth century, of which there remain remains at the north and south ends of the main building. The castle belonged to the family of Cardaillac, coseigneurs of Cardaillac, Saint-Cirq-Lapopie and lords of Cieurac. It was occupied and plundered by the English between 1356 and 1358. The castle was bought by the consuls of Cahors and doubled its defense. Then they returned it to the family of Cardaillac after the Hundred Years War. Raymond de Cardaillac had participated in the league of the public good with other lords of Guyenne. In 1487, by order of Anne de Beaujeu, the armies of King Charles VIII destroyed the castle of Cardaillac in Saint-Cirq-Lapopie. Raymond de Cardaillac then decided to rebuild the castle of his family at Cieurac. Raymond de Cardaillac (1450-1501) took part in the first Italian war with Charles VIII. He died in 1501. The beginning of the reconstruction had to start shortly before 1501. His son, Jean-Jacques de Cardaillac (1476-1515), councilor and chamberlain of the king, governor and seneschal of Quercy from 1500. He held rights over the fief of Cardaillac and the seigneuries of Cieurac, Aujols, Biars and Concots . He continued the construction of the castle. In February 1503, Jean-Jacques de Cardaillac married Jeanne de Peyre (1480-1509), daughter of Astorg de Peyre in Gevaudan. Her coat of arms was carved on the facade with those of her husband. Their son, Antoine-Hector de Cardaillac (circa 1500-1567), married in 1532 with Marguerite de Caumont, converted to Protestantism. He fortifies the castle.